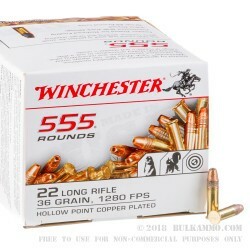 5550 rounds of Winchester 36 grain copper-plated hollow point 22 LR ammo will strike fear into the hearts of squirrels everywhere! The typical muzzle velocity on a 36 gr .22 LR round is 1,328 ft/s. Winchester has spent over 100 years refining their rimfire process, and each cartridge is subject to dozens of quality control checks and must meet specific specifications to reach the market. 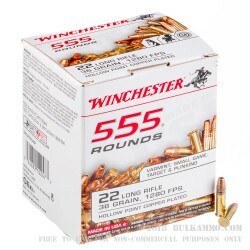 Winchester rimfire ammo is manufactured in Oxford, Mississippi. They celebrated 150 years of business in 2016 and are an icon of American sports and outdoors. 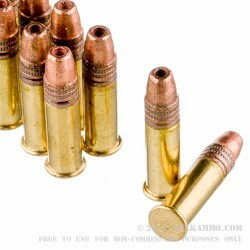 They have been making rimfire ammunition including .22 LR since the 1800s. 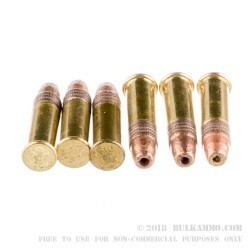 Q: What is the velocity on these rounds? A: Hello Brian, Winchester lists the muzzle velocity of this round at 1280 fps.